For the fifth year, local companies will help students of all ages explore their options in high-demand, high-growth industries at the “When I Grow Up Expo” on Saturday, April 22, 2017. The event will take place from 10 a.m. until 2 p.m. at the Hattie Mae White Educational Support Center (4400 W. 18th Street, 77092). Students will have the opportunity to talk with local employers about future careers, experience the Mobile Oilfield Learning Unit, and compete in various student competitions in subjects such as cosmetology, movie making, construction, and culinary skills. Food trucks will be on hand, and participants will be able to enjoy student performances by HISD fine arts programs. Students also will enjoy hands-on career awareness and exploration activities, including the STEM Museum on Wheels, Home Depot workshops, the Career Ready Wagon, a gyroscope, and more. Last year, about 6,000 students, parents, and community members attended the annual expo, which featured exhibitors such as Exxon Mobil and CenterPoint Energy, and included family-friendly activities and food vendors. For more information, please see the Career Readiness webpage or call 713-556-6981. 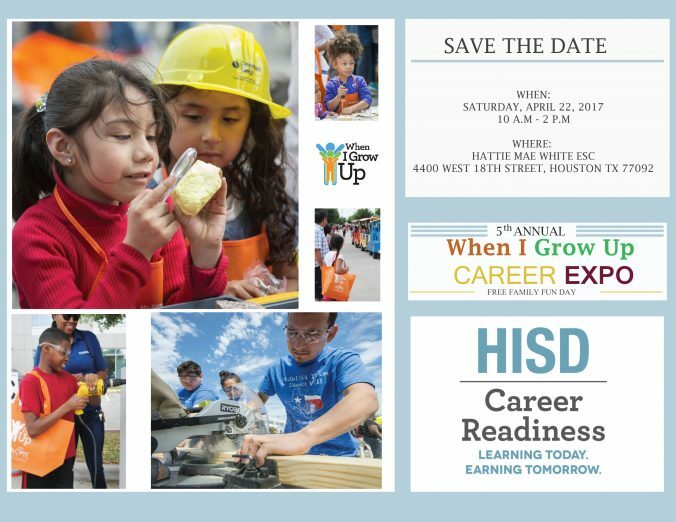 This entry was posted in Career/technical education (CTE), News, Special events and tagged When I Grow Up on April 4, 2017 by HISD Communications.